New Study On Aspirin and Diabetes: A baby aspirin a day can help prevent a heart attack, according to the experts. If you are in the throes of a heart attack, it is recommended that you take a chewable aspirin. We all know there are numerous cases where the use of over-the-counter aspirin can be helpful to the extent that it can save lives. A goal of a recent study in Canada was to see whether taking aspirin could prevent a first or second heart attack or stroke in those with diabetes. That newly released study has given results on the use of aspirin as a preventative measure for heart disease and the recurrence of episodes in patients with diabetes. The study was carried out at the University of Alberta, Canada, by researcher Scot Simpson, an Associate Professor in the Faculty of Pharmacy and Pharmaceutical Sciences. Simpson concluded that diabetic patients who had already suffered a cardiac or stroke condition who were taking a “low” dose of aspirin daily had “very little benefit” in terms of preventing a second heart attack or a decreased risk of mortality. 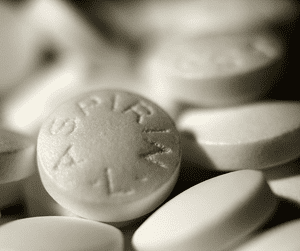 But, the patients taking “higher” doses of aspirin showed a significantly lower risk. The researchers took the results from 21 different studies and zeroed in on diabetic patients who had already had a heart attack or stroke to see how aspirin could prevent a second episode. The results were that when taking 325 milligrams of aspirin per day there was a 23 percent lower risk of death. Simpson stated that people with diabetes have an increased risk of cardiovascular disease, “adding there is evidence that suggest as much as 60 percent of deaths in diabetics is attributable to heart disease.” Simpson stated that “pharmacists could have an active role” in helping patients with their questions regarding aspirin. Before making any changes in your medication, always check with your doctor first, especially when it comes to any over-the-counter medication. People with type 2 diabetes, in many cases, take several different medications. The addition of aspirin, without their doctor’s consent, might lead to unnecessary problems and hospitalizations. Aspirin (acetylsalicylic acid) has been around for many, many years and is most commonly used as an analgesic to relieve minor aches and pains, to reduce fever and is an anti-inflammatory medication. There are side effects from taking aspirin. These include, but are not limited to, stomach upset, bleeding in the stomach (ulcers), and tinnitus (ringing in the ears), especially at higher doses. As well, aspirin is no longer recommended for use in children when they are suffering from a cold, the flu or chickenpox or other viral sicknesses because of the risk of Reye’s syndrome. Take care to always check with your physician before adding aspirin to your medicine routine or increasing the dosage, if you are already taking aspirin. The side effects can be serious and life threatening. Your physician will know your medical history and will be able to advise you on whether or not you should add aspirin on a daily basis and whether or not you should increase the dosage. This entry was posted in Diabetes News on July 15, 2011 by admin.